Gyro is of course the classic dish of greece. 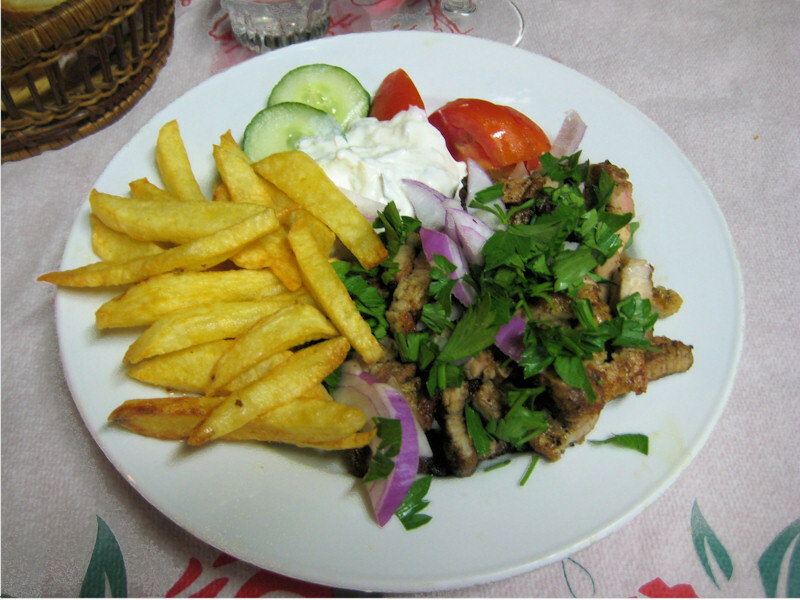 Here in our restaurant each serving of gyro is freshly grilled and flavored with fresh herbs. Sprinkled with sweet red onions, this results in a combination with a very delicate and mild heat. In addition to our gyro we of course serve our homemade Tzatziki. This is one of the great kitchen secrets of the Smaragd. It is still made according to ancient recipes out of our family tradition. It´s made out of well hung yoghurt and rhodian herbs and spices. And of course with cucumber.., rhodian cucumber which still tastes like cucumber and not like water. Additionally we serve fresh homemade fries. All together it’s a properly prepared taste experience. This entry was posted on 19. September 2009 at 02:16 and is filed under Main Dishes, Speisekarte. You can follow any responses to this entry through the RSS 2.0 feed. Both comments and pings are currently closed.